Gengen Kusano’s Last and First Idol is a work of mind-blowing SF that could only have come from Japan. It was released in English this past September by J-Novel Club, translated by Andrew Cunningham. I emailed with him to hear a bit about his experiences as a translator on this title, what kind of body mod he would find useful for work, and more! Emily Balistrieri: Tell us about the book! 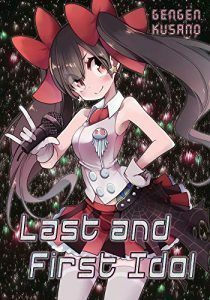 Andrew Cunningham: Last and First Idol is a collection of sci-fi stories by Japanese author Gengen Kusano that blend aspects of modern otaku culture with pretty heady sci-fi theoretical physics and a solid dose of body horror. The title story involves an idol singer resurrected in the post-apocalypse and forced to create her own fans. “Evolution Girls” involves reincarnation in a world where bodies are built via the laws of gacha games. And “Dark Seiyuu” looks at celebrity-worship through a lens of Aristotelian physics, where space ships are piloted by vibrating the aether. EB: How did you end up translating it? Had you heard of it before you got the job? What did you think when you first read it? AC: I ended up translating Last and First Idol because Sam at J-Novel Club was crazy enough to license it. We’d talked about a previous project that hadn’t worked out, and he wanted a veteran on this because of the sheer difficulty of it. I wanted to challenge myself with something a little more difficult than your average light novel, and the way he described the book sounded like something I’d enjoy. EB: Do you have a science background or did you have to do a lot of research for the hard SF aspects? AC: I have no science background at all. But the actual jargon isn’t really the difficult part of translating science fiction—it’s the ordinary words around the jargon. Science tends to use language very specifically. Translating the words the way I usually would might not end up matching how an expert on the subject would speak, and might even end up meaning something quite different from intended. Fortunately Sam—who edited the book—does have a background in quantum physics, and was able to adjust the language in places where Wikipedia just overwhelmed me. EB: How does working on Last and First Idol compare to some of your other projects, such as the Boogiepop series? AC: It took at least twice as long to do a page, and there was a ton more research. But fundamentally I don’t think my process was much different. My actual background is in screenwriting, and I became a translator because it was everything about screenwriting I liked without the pesky part where you have to come up with a good plot. So I’m most confident when it comes to naturalistic character writing, and suggesting characters in a few lines of dialogue, which was actually quite helpful for grounding a book as weird and concept-heavy as Last and First Idol. EB: If you could have one body mod to assist your translator activities, what would it be/do? AC: If there was a way to make the computer always be in the language I want to type in, that would be great. It seems like it’s always in the other one and I always have to backspace and switch. EB: How much of your free will do you allow to be sucked up by mobile games? AC: I have been in and out a few times, and am pretty good at not spending money. But the temptation to have a game you can just fiddle with for a few minutes on breaks somehow always leads to feeling like you’ve got to use up your whole stamina bar, and then it becomes a chore, and you swear off mobile games, and install a new one a few days later. I recommend keeping a low end phone because then the games don’t work very well. EB: Do you have any translators you admire so much that you might want to chase them through outer space (preferably not to kill them, though)? Toren Smith and the Dark Horse crew were probably the biggest influences on my idea of what translations should read like. Just always finding ways to make it read more naturally, trying not to let it be obvious when you’ve hit one of those Japanese expressions that you hate translating. Making sure the conversations flow and the lines play off each other, while still being true to the voicing of the characters and the tone and intention of the scene. I feel like the moment I let myself think I can do that is the moment I’m done as a translator, so to my mind that’s still a distant goal to aspire to. EB: Are there other Japanese SF novels in translation you recommend? Or any you are hoping to translate in the future? AC: It’s difficult to recommend novels in translation because I haven’t read a book in English in nearly twenty years. My to-read pile in Japanese is always so high some books on it are doomed to be sold off without ever getting read. There’s certainly ways I could improve as a translator by reading other translators work, but I don’t have the time! I have to rely on memories of all the stuff I read the first twenty years of my life. Even in Japanese, I found the sci-fi scene to be a little daunting; I got the impression it was all about the ideas, and I’m more about the crazy. Even Last and First Idol got my attention more because it sounded like the work of a sci-fi Maijo Otaro, who remains my favorite Japanese writer. (I translated his “Drill Hole in My Brain” for Faust, but so far have yet to convince anyone to take a risk on translating more of his work.) I think the best writers of weird sci-fi (or weird novels in general) find ways to ground the crazy in something that feels authentic, and finding that vein of authenticity is a very satisfying thing to do as a translator. Andrew Cunningham is a translator based in Seattle. Recent and upcoming credits include Kouhei Kadono’s Boogiepop series, Tomihiko Morimi’s Penguin Highway, The Ancient Magus’ Bride: The Golden Yarn prose anthology, and Dachima Inaka’s Do You Love Your Mom and Her Two-Hit, Multi-Target Attacks?. Follow him on Twitter @BuddyWaters. A fantastic interview. I've never expanded my japanese past the basic hiragana, katakana and a few kanjis but I've always had an interest in doing translation work, and read this interview hoping to understand the mind of a veteran translator more. I want to say thanks to Andrew that his contribution about translation for Kusano's first work including proper sub-cultural context. It's reasonable and understandable for me that he likes Maijo's works. Personally, I'm leading the project with several engineers, humanity researchers, and sci-fi writers (http://aisf.work/en/). It's great honor if we have a chance to provide helps for international connections on Sci-Fi.